Earlier this week I posted the blog, Is It Worth It To You? The photo I posted with it was accidentally labeled as an iStockphoto, but actually—I took it myself several weeks ago. I have re-attached it here because of what it represents—I want you to know who this little guy is. As I mentioned in that post, the photo was taken outside of Cairo. But this is not what the city of Cairo looks like—allow me to explain. 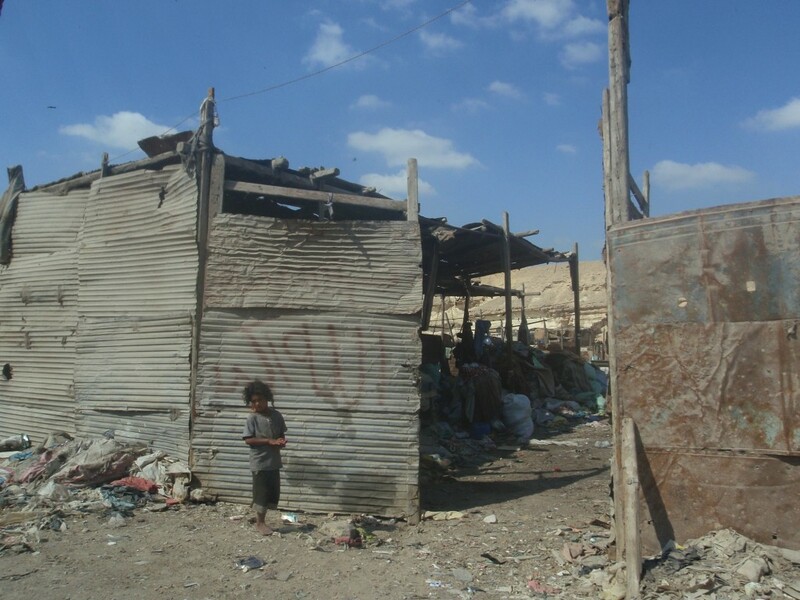 Just outside of Cairo, there are five “garbage cities” in different locations that collect and process trash from the region. Each one of these “cities” is an independent community in itself. Some of these are smaller than others—several are quite large. Many people occupy each garbage city—they work, eat, sleep, marry, raise children, and go through life within its confines. They are not derelicts of society or deadbeats that don’t want to work—they are some of the most wonderful, hardworking, respectable people I have ever met. If you left click on the photo it will open the picture in a new window. Click again for the close up, which gives a better idea of the living conditions. The bags under the makeshift roof are filled with rags and cloth that will be carried by hand or cart back into the city to sell to industry. This is how they make a living. Adults and children alike, sort through the trash separating out anything that can be reused. One group will repair shoes or clothing, another will empty partially filled shampoo bottles into one they can sell, while others gather paper and magazines into bundles to sell to the paper mills. There is no electricity, no running water, no heat or cooling. The summer is hot and the winter cold, but they go on doing what they need to do. In spite of the fact that they have nothing to offer, the little boy in this picture offered me a drink from a bottle of water. It was less than half full, but it was all he had and he was offering it to me. These precious people asked for one thing—they asked us to teach them to suture their wounds so they can care for their community and perhaps prevent death. Several die each year because of wound infections since they have no medications and no way of repairing lacerations, which at times are severe. Working hard in order to move out of garbage city is not an option. If you are born within its walls, you are likely to remain there your entire life—that is simply the way it is. They don’t complain—they are happy to be alive. The boy in the photo is a Christian because someone cared enough to go there—to carry the Gospel to a strange, unpleasant place. But one may wonder if it will last in such an extreme location. The fact is, as I took the photo above, I was standing with my back to the church they were in the process of building with their bare hands—in the middle of Garbage City. There are now 1000 Christ followers in this community and 2000 Muslims. They are reaching out to their neighbors to bind their wounds, and touch their hearts. By the way, all photos on my blog will have identifiers embedded within them. To see the title/description, glide the cursor over the photo and leave it for a second, the label will appear. To find where the photo came from (if there are credits or an origin is documented) left click directly on the photo. Question: If God wanted you to live with these people or others like them in order to share the Gospel, what would you do? Please share your thoughts below. Previous: Is It Worth It … To You? Next: Sheep … Or Goat?